Norman Rae Taurog (February 23, 1899 – April 7, 1981) was an American film director and screenwriter. 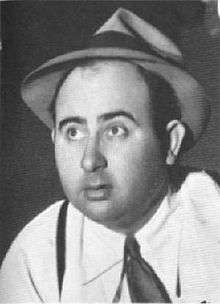 From 1920 to 1968, Taurog directed 180 films. At the age of 32, he received the Academy Award for Best Director for Skippy (1931). He became the youngest person ever to win the award, a record that still remains unbroken as of today. He was later nominated for Best Director for the film Boys Town (1938). He directed some of the best-known actors of the twentieth century, including his nephew Jackie Cooper, Spencer Tracy, Mickey Rooney, Judy Garland, Deanna Durbin, Fred Astaire, Gene Kelly, Deborah Kerr, Peter Lawford, Dean Martin, Jerry Lewis, and Elvis Presley. Taurog directed six Martin and Lewis films, and nine Elvis Presley films, more than any other director. For his contribution to the motion picture industry, Norman Taurog has a star on the Hollywood Walk of Fame at 1600 Vine Street. Norman Taurog was born February 23, 1899 in Chicago, Illinois, to Arthur Jack Taurog and Anita (originally "Annie") Taurog (née Goldsmith). His father's naturalization records claim that Arthur was born in the Russian Empire in 1872 or 1873 and naturalized as a minor, while his mother was from New York. Later census records claimed that Arthur's parents were from Germany, and Anita's were from England. The couple were married in Chicago in 1896. In 1919, Taurog returned to the movie industry as a director, collaborating with Larry Semon in The Sportsman (1920). In the coming decade, he made 42 silent films, mostly shorts. During this time, he developed his style, his forte being light comedy although he could also deal with drama and maintain complex narratives. 1 2 "Norman Taurog". Allmovie. Retrieved September 8, 2012. 1 2 3 4 5 6 7 "Norman Taurog". Internet Movie Database. Retrieved September 8, 2012. ↑ "Unpublished Wizard of Oz Photos from the Estate of Norman Taurog - PBA Galleries". Retrieved 13 March 2016. ↑ "Norman Taurog, Director, Dies". The New York Times. April 10, 1981. Retrieved September 8, 2012. ↑ "Awards for Norman Taurog". Internet Movie Database. Retrieved September 8, 2012.